Forget Lindsey Vonn and Adam Rippon. The real rock stars of the Pyeongchang Olympics are a humble group of Korean curlers who have no idea they've become a global sensation and are now bound for their country's first ever gold medal match — at home. They are known as the "Garlic Girls," the South Korean women's curling team with the fairy-tale story whose moniker reflects the locally-famed garlic grown in their hometown. On Friday, they beat Japan 8-7 in an extra end to advance to the final against Sweden, who defeated Great Britain in the other semifinal. Japan gave South Korea a scare at end 10 to tie the game when South Korean skip Kim Eun-jung failed to seal the match on her final "hammer" shot. Japan then forced the Garlic Girls to secure their win again on the hammer in a dramatic finish. Never considered a medal contender coming into Pyeongchang, the team has risen to No. 1 in the rankings, earning worldwide attention for their fierce talent and funny personalities. ‘Hurry! Hard!’ What Exactly Are Curlers Yelling? And yet the Garlic Girls have been almost totally sheltered from the international frenzy both by personal choice — they switched off their phones during the games to block outside attention — and by a protective coach who is keenly aware that curling is as much a mental game as a physical one. After a recent match, the women were quickly shuffled past waiting reporters, giving journalists apologetic smiles and greetings of "Anyonghaseyo!" (hello) before vanishing. None of them, says coach Kim Min-jung, are aware that they've become superstars. "I'm sorry that I could not bring the athletes today, because I'm worried there will be too much pressure and burden on them," Kim said. "Even the crowd is too interested in them." That interest is understandable. The Garlic Girls seem tailor-made for stardom. The wildly skilled underdogs came into the Olympics ranked eighth in the world and went on to crush curling heavyweights including Canada and Sweden. They are cute and comical, referring to themselves by quirky nicknames such as "Pancake" and "Steak." Two teammates are sisters and all are longtime friends, creating irresistible chemistry on the ice. The team's "skip," or captain, has a steely gaze and funky, owl-eyed glasses that have become fodder for endless Internet memes. Many Koreans who have never seen a curling match have nonetheless traveled to remote Gangneung to peek at their nation's new darlings in person. "I'm very proud of them," said Lee Ji Sun, a 26-year-old who had never been inside a curling arena before Wednesday's match. "They are showing we can do well even in new sport events." Every match featuring the team is packed with screaming, flag-fluttering Koreans who leap to their feet to cheer on the women's stunningly precise shots. One fan in the crowd Wednesday waved what appeared to be a hand-drawn portrait of skip Kim Eun-jung with her trademark spectacles. The excitement surrounding the women even prompted a few dozen senior citizens from the southern city of Jaecheon to charter a bus to the arena so they could revel in the country's newfound curling prestige. "I actually don't know curling rules, so I have to find out what's going on from people sitting next to me," said Yang Chang-nam, 77. "I feel very good as the South Korean team is doing well." That curling has gained any prominence in Korea is surprising in itself. 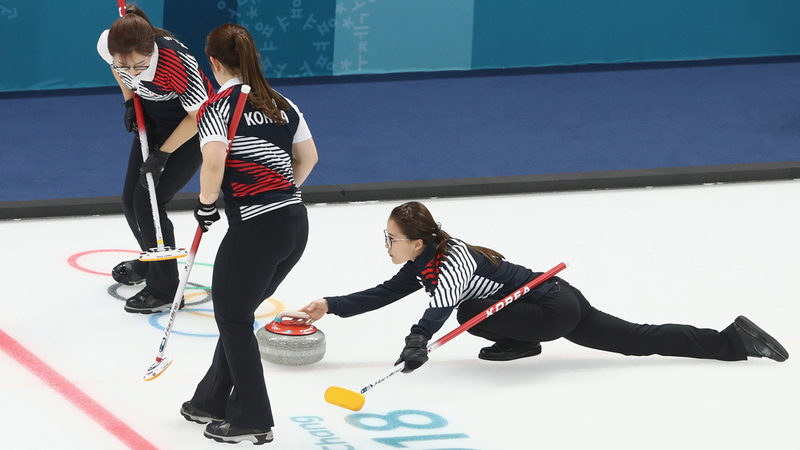 Korea didn't even have a team in Olympic curling until the 2014 Sochi Games. It took Koreans awhile to wake up to curling, largely because the country lacked sufficient facilities until recent years, Kim Young, a curling legend who started the Korean Curling Club in 1988, said by email. Now, he says, Korea has six dedicated curling arenas, and many schools have curling teams. In 2006, South Korea's first curling center was built in in the rural town of Uiseong. Four of the five team members attended Uiseong Women's High School, where they were on the school's curling team. Uiseong's reputation as the nation's default curling capital slowly grew, and the curling center has hosted about 15 major domestic and international curling events. Still, until the women's team began their surprise winning streak in Pyeongchang, Uiseong was better known for its prolific garlic production. Like many fans at Gangneung, Seo is particularly fond of the curlers' unusual nicknames: Sunny, Steak, Pancake, Annie (a brand of yogurt) and ChoCho (a type of cookie). "I think their nicknames go well with their lively images," Seo said. "I like 'Steak' the most. It sounds so funny and unique." Norway's Olympic curling team has gained attention for their colorful, themed pants. The nicknames started as a gag over breakfast one day, said Kim, the coach. The women were talking about how difficult it was for other countries' athletes to pronounce their names at international competitions. All five team members and their coach also share the same surname — Kim, which is very common in Korea — making their names even more confounding for foreigners. Kim Seon-yeong, who was eating a sunny-side-up fried egg, joked that she could go by the name "Sunny." The other women loved the idea. They each opted to nickname themselves after the English words for their favorite breakfast foods, figuring that would be easier for others to grasp. Though the women's team is getting the most attention, Korean fans have been going wild for the men, too. After Wednesday's men's match, a player from the Korean team began throwing T-shirts into the crowd, which surged forward with outstretched arms. Kim Heae Darm, a fan who leaped up and managed to snag a shirt sailing overhead, pressed it to her face and screamed with glee. She then turned to capturing the attention of Korean mixed doubles player Lee Ki-jeong, who scrawled his autograph in her notebook. As she struggled to catch her breath, she explained her excitement by noting that Lee was strong, athletic and "very handsome." "I like them so much!" she squealed. Kim believes the exposure the sport has received in Pyeongchang will lead to an influx of new curlers in the country, particularly because parents will support children taking it up. As for the success of the women's team, Kim, the founder of the curling club, couldn't be prouder. "They are heroes!" he said. Yet the Garlic Girls do have one request: Maybe someone could come up with a nicer team name for them? "We would prefer the name 'Team Kim,'" Kim, the coach, said with a laugh. "Because although our hometown is Uiseong — which is related to garlic — we have no relationship with garlic at all." Kristen Gelineau and Hyung-jin Kim, Australia bureau chief and Seoul correspondent respectively for The Associated Press, are on assignment at the 2018 Pyeongchang Winter Olympics. Follow them on Twitter at @KristenGelineau and @hyungjin1972. People seem to think U.S. Olympic curler Matt Hamilton looks familiar.